Westchester Marketing Café LLC is excited to share this great local opportunity for our youth. We are avid supporters of girls in tech as well as the guys. 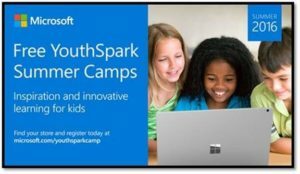 Free YouthSpark Summer Camps are an awesome opportunity for kids to get more techie. Kids will learn how to create their own games and apps, and turn their business ideas into a reality, in a fun and supportive environment at the Microsoft Store. In this free, intermediate-level camp for kids ages 12 and older, students use TouchDevelop, an interactive programming environment website, to create and publish their own video game called Flatverse. As they build their game, they're exposed to various computer programming and coding concepts, including screen coordinates, random numbers, objects and functions, and more. Throughout the series, they'll take a deeper dive into these programming and coding concepts to gain more confidence and skill. The ultimate goal is for attendees to gain an appreciation for coding’s role in the games they may play in their daily lives, and to provide an inspirational foundation for pursuing their interest in computer science. This four-day camp lasts two hours per day, and campers must attend the days consecutively. Create rich and exciting games with Kodu Game Lab in this free, beginner-level camp for kids ages 8 to 11. They'll work on Kodu games like Boku’s Amazing Race, Flashy Fishbots, and Air Delivery. In the process, they learn how interesting and powerful games can be created with simple building blocks and techniques. Attendees analyze and revise game character, write code to create game action, collaboratively plan and create a Kodu game, give and receive peer feedback, and explore the iterative design process. Some activities will be interactive tutorials, while others entail hands-on, open-ended game design. Every session will include collaborative design and development activities. Be inspired in this free, interactive camp that offers entrepreneurial kids age 13 and older the knowledge, tools and support to make their business idea a reality. Teens get a hands-on, inclusive, and fun Workshop experience packed with real-life entrepreneurship tools that can help them develop their unique ideas and launch a business. The course aims to generate excitement, offer support, and foster collaboration as participants experience working together to bring their ideas to life. Find out more and Register today at the White Plains Microsoft Store, spaces are limited. Posted in Newsroom and tagged app development, camp, coding, game, kids, youth, youthspark.